Annettes home is exactly as described. It was very clean and cozy. The master bedroom bed was a memory foam mattress and was incredibly comfortable. Check in was easy albeit more involved than Im used to then again the extra work made the area very safe. The hot tub was absolutely needed after a long hot day at Disney. Close to all needed shopping such as Publix and Super Target. Our family had a wonderful experience. 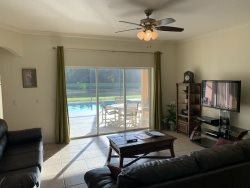 Great location, very close to Disney and local shopping (grocery) / places to eat. Pool feels great after a long day. Neighborhood was quiet and felt very safe. fantastic Villa and location, it was that good I didnt want to leave, I would have happily moved in for life! I cant really add anything else, it was 5stars for me. Left on Aug 7, 2017 for a stay in Jul 2017 We loved the house,location and the privacy.Everything was great!We would recommend this place!My kids loved the rooms,the private pool,and the great game room in the garage. Beautiful place and excellent customer service! !